Here are a few examples of some basket styles you may choose from. Baskets are available in wicker or willow, with or with out handles, some round, others rectangular or oval. Lots of choices for YOU! This basket was created for a customer using a natural willow fireside basket. 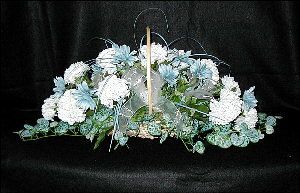 It contains white carnations, blue cosmos, blue and green foliage sprigs and blue onion grass spikes radiating from the center for a wispy look. It is about 24" in length and 12" tall. She is using it as a centerpiece on her dining room table. Your choice of colors for this design. Fill in the extra info box on the order form. A white painted wicker fireside basket filled with yellow roses, pale yellow carnations, yellow lilies, greenery and a yellow tulle bow was used as a wedding reception centerpiece. You can have this basket made in your color choice. Give me that info in the extra box on the order form. This basket features a white painted Princess basket suitable for a flower girl to carry in a wedding. It contains dark peach (or coral) roses and tiger lilies plus white rose accents. Cascading white and peach ribbons from the handle add a delicate touch. It may also be used as a centerpiece. What colors would you like? Please tell me in the extra info box on the order form. I will be in touch with you to work out all the details. A wall basket in the shape of a parasol. 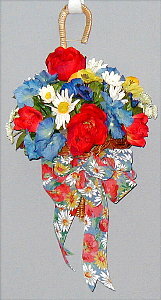 This one is dressed in red, white and blue with a touch of yellow. Tell me what colors you would like in the extra info box on the order form.